This section describes specification of triggering schedules. Note that exact trigger times are not guaranteed. There may be couple of seconds delay. 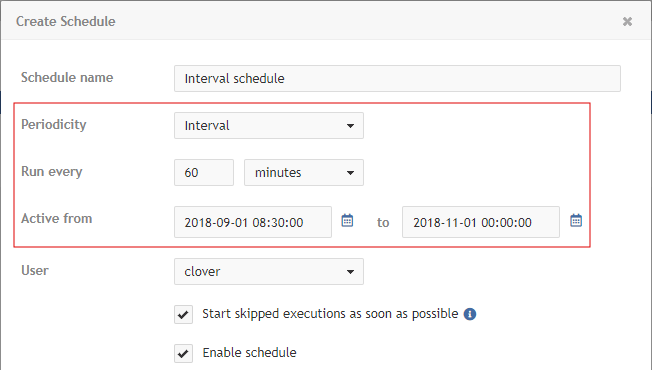 Schedule itself can be specified in different ways. This schedule is triggered just once. Start time Date and time, specified in the yyyy-mm-dd hh:mm:ss format. If checked and execution is skipped for any reason (e.g. server restart), it will be triggered immediately when it is possible. Otherwise it is ignored and it will be triggered at the next scheduled time. Specifies interval between two trigger times (in minutes). The next task is triggered even if the previous task is still running. Active from/to Date and time, specified in the yyyy-mm-dd hh:mm:ss format. Timetable is specified by a cron expression. Cron is a job scheduler which uses its own format for scheduling. i.e. 0 0/2 4-23 * * ? means "every 2 minutes between 4:00 AM and 11:59 PM". When setting up a cron expression, a hint displays it in a human readable format. Furthermore, when you click on each of the field in the expression, the hint expands, indicating which part of the expression you are editing and listing symbols, their meaning and values that can be used in the expression. Server cron expression for Days of Week differs from *nix cron expression. 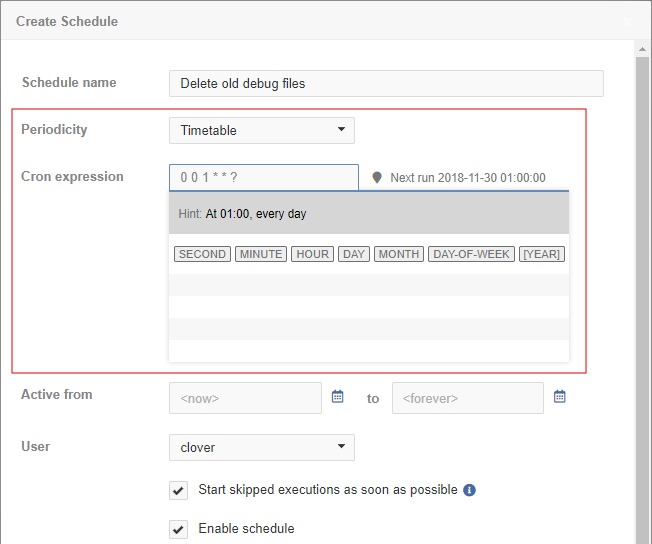 Days in cron expression in Server start from 1 which corresponds to Sunday. *nix cron expression uses 0 or 7 for Sunday.